Montco&apos;s Best Pizza Down to Final Two! KING OF PRUSSIA, PA – Montco’s Best Pizza Tournament has its Final Two: Bravo in Worcester, and Vince & Friends in East Greenville. Almost 23,000 votes were cast in the last round, with less than 200 deciding one match-up. Pizza-lovers have until 10 p.m. Sunday, April 8 to vote for the champion, which will be announced Monday, April 9. For the third year in a row, the Valley Forge Tourism & Convention Board is pitting pie against pie. The organization called for nominations of people’s favorite pizza places on social media throughout the month of February, and narrowed the list of hundreds down to 64 contenders that people began voting on March 1. This year, there were 32 new competitors to start. The pizza shops also received a marketing kit, delivered by hand in a pizza box carton. Inside were giveaway magnets, a pad of tear-off voting requests to accompany customers’ checks, and a copy of Crave, the VFTCB’s award-winning dining guide. New this year, the box also included a poster to advertise the tournament in or outside the store. The tournament began in 2016 when the VFTCB’s social media pages got heated over a list of recommended pizza shops, and the organization took the opportunity to create a community-involved contest with the March Madness-style bracketed competition, originally pitting 32 pizza places against each other. Chiaro’s Pizzeria & Restaurant, Green Lane, was crowned champion two years in a row, but is not competing in this year’s contest. While the discussion often diverts into an active debate on tomato pie, the VFTCB has ruled that the doughy, saucy concoction doesn’t constitute pizza. 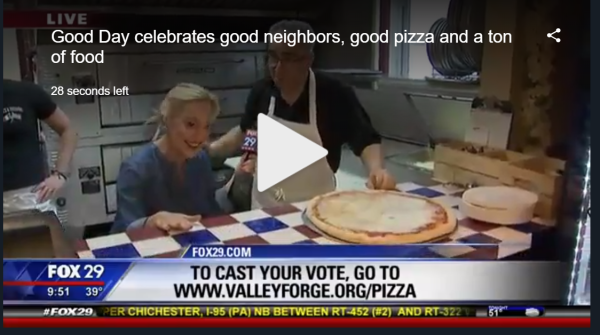 All votes are cast online at valleyforge.org/pizza. The tournament leverages the VFTCB’s considerable social media reach. Last year, the VFTCB saw an upswing in social media-driven click throughs to its website, which surged more than 1,000 percent over the course of the year. The best-pizza topic reached more than 400,000 people on Facebook, and its associated YouTube videos were watched more than 80,000 times. The Marketing and Communications successes have caught the eye of several third-party industry awards organizations, earning three awards by firms that included PR News, a best-practice publisher with editorial offices in New York. The 2018 Montco’s Best Pizza Tournament closes on April 8. Once results are tabulated, the winner will receive an engraved plaque mounted on a wooden pizza paddle as a trophy. The Valley Forge Tourism & Convention Board (VFTCB) is a nonprofit, membership-based sales and marketing organization that actively promotes Valley Forge and Montgomery County, PA as a convention site and leisure visitor destination by encouraging patronage of its 500+ member hotels, restaurants, attractions, and services. The award-winning website links visitors, meeting planners, tour operators, and residents to a diverse portfolio of brands focused on reasons to visit the region.